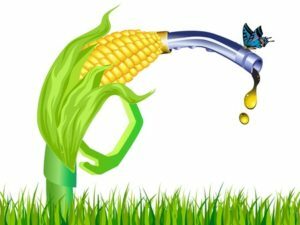 Biofuel is the name given to any type of fuel source where energy is derived from a biological process. These fuels can be derived from plant based sources or via other organic processes. The term biofuels is a relatively wide-reaching one, covering many different types of solids, liquids and gases. The three most common biofuels are Biodiesel, Bioethanol and Biogas. All of these substances can be created by small-scale producers, but can also be produced on a much larger scale. Biodiesel is a vegetable or animal-based fat which has been chemically reacted with an alcohol to produce fatty acid esters. Biodiesel can be used in its purest form, although it is also sold as a blended substance when mixed with standard diesel types. Most biodiesel mixes which contain less than 20% bio-products can actually be used in standard diesel engines with little or no modifications. Biodiesel can be made of a wide variety of different biological substances, including; palm oil, rapeseed, soy, peanut, sunflower, hemp, coconut, Chinese tallow and even coffee grounds. Although it is possible to make biofuels out of all of the aforementioned substances, this does not mean that it is always feasible to do so on a large scale. However, individuals or small businesses who have access to these products or who are left with these substances as waste products may wish to consider the feasibility of personal fuel production. Many global governments are currently working on programmes to derive biodiesel products from the most plentiful waste products in their individual countries. Biogas is another popular type of biofuel which is produced by an intense biological process. When any form of organic matter starts to breakdown in a situation where there is an absence of oxygen, a mixture of different gases is produce. This is known as anaerobic digestion. During the digestion process, organic polymers in the waste products are quickly broken down. Acidogenic bacteria in the waste substances then convert the resulting sugars and amino acids into organic acids, hydrogen, ammonia and carbon dioxide. Any organic acids are subsequently converted into acetic acids. Microorganisms known as methanogens finally convert the remaining acids into methane and more carbon dioxide. Any waste products which are not converted into gas are known as digestate. When the anaerobic digestion process occurs in a controlled environment, it is possible to collect these gases and use them as a biofuel source. Special anaerobic digester units have been built to harness this awesome biological process so that waste products can be converted into a fuel source. It may also be possible to use the remaining digestate as an agricultural fertiliser. This makes biogas production an appealing prospect for farmers. The anaerobic digestion process can also create heat and high pressure within the digester. It is therefore important that producers take the necessary safety procedures to ensure that workers are not put at risk. Care must be taken when emptying a biogas tank for maintenance, because biogas can react with air at certain concentrations. Negative gas pressure in the system can also cause an explosion.